Thank you for your thoughtful appreciation of my painting, Colleen! You are very kind, Sunil! 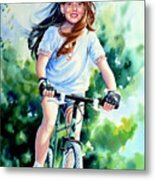 Thank you for your thoughtful appreciation and support of my painting! Thank you for your thoughtful appreciation and support of my painting, David! Beautiful in every way, Hanne, truly masterful and joyous at the same time. FL! Thank you for your kind enthusiasm and support for my painting, Lynda! Thank you for your gracious comment, Maya! Thank you for your dear comment and support, Vicki! 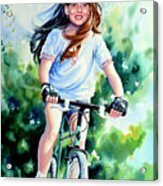 Exuberant joy and life captured in the wonderful portrait. Thank you for your kind comment and support, Dennis! Thank you for your thoughtful comment and support, Dominique! Thank you for your enthusiasm and support for my painting, Marvin! 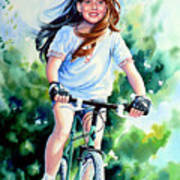 The movement in this beautifully done painting of a happy young bicyclist really enhances the subject, Hanne! Your depiction of the girl's hair is superb - L/F! Thank you for your enthusiastic comment and support of my painting, Michele! Thank you for your thoughtful comment, Ali! Thank you for your kind comment, Asha! Thank you for your kind comment, Shari! Thank you for your thoughtful appreciation and support of my painting, Sandi! Thank you for your gracious comment, Tony! Thank you so much, Debbie, for your kind support and generous promotion! Thank you for your kind comment and support, Zulfiya! Thank you for your sweet comment and support, Carlin! 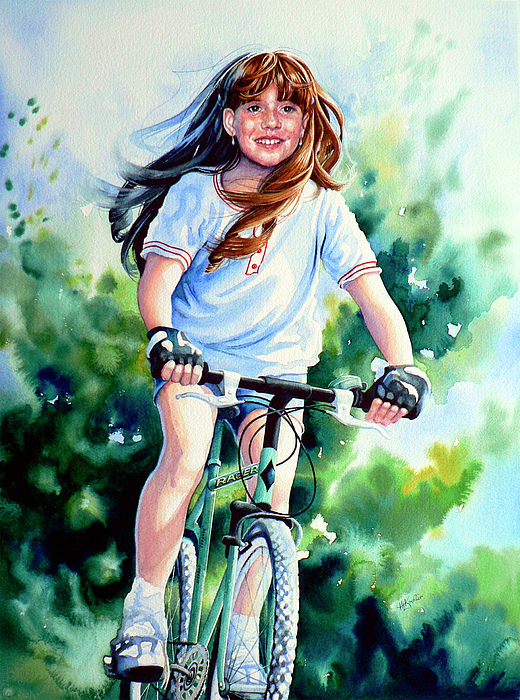 This action watercolor portrait brings back happy childhood memories of carefree summer days riding a bike, wind in your hair - no care in the world.